Thursday evening we headed to the brand new Bridge Theatre, on the South Bank just by Tower Bridge. Nicholas Hytner, former Artistic Director of the National Theatre, opened the Bridge just this fall, and Julius Caesar is their second production ever, and the first he has directed there. Marc Antony addresses the crowd over Caesar’s body. The production was set up in the round, with seating on three levels, and a large part of the audience standing in the middle. The production’s emphasis was on the public, the mob. The production opened with a rock band entertaining the crowd, who had been given political signs to hold, and cheered for Caesar’s eventual arrival. Throughout the production, security guards in orange vests moved the crowd around, and the mob responded to each speech and public event. In our conversation Friday morning we had two broad responses to the production. We saw a great deal of success in the ways it brought our focus to the manipulation, response, and power of the public throughout the play, especially up through the competing speeches from Brutus and Marc Antony. We also saw that individual moments, and specific acting choices, tended to be lost in the production. There was a lot of yelling. While in some ways this felt like a trade-off, we wondered whether it might be possible to create a production that did both. On Friday afternoon, some tour-goers took a walking tour of the Inns of Court, and others went to the National Theatre for a behind the scenes tour of the facility–perhaps the most fully equipped non-opera theatre in the world. Once again, the threatened rain decided not to arrive, and temperatures remained enjoyably in the 50’s all day. 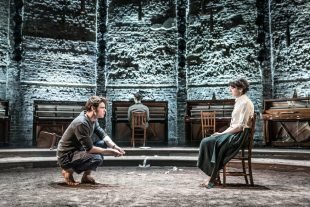 On Friday evening, we headed out to the Almeida Theatre in Islington, for a production of Tennessee Williams’s Summer and Smoke. 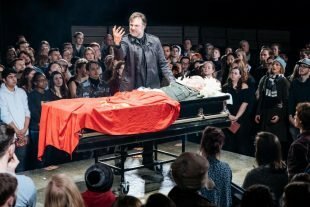 On a largely blank wooden stage, with dirt along the edges, and surrounded by nine pianos, the company brought us what we all agreed the next morning was a remarkable, deeply felt, and imaginatively staged evening of theatre. 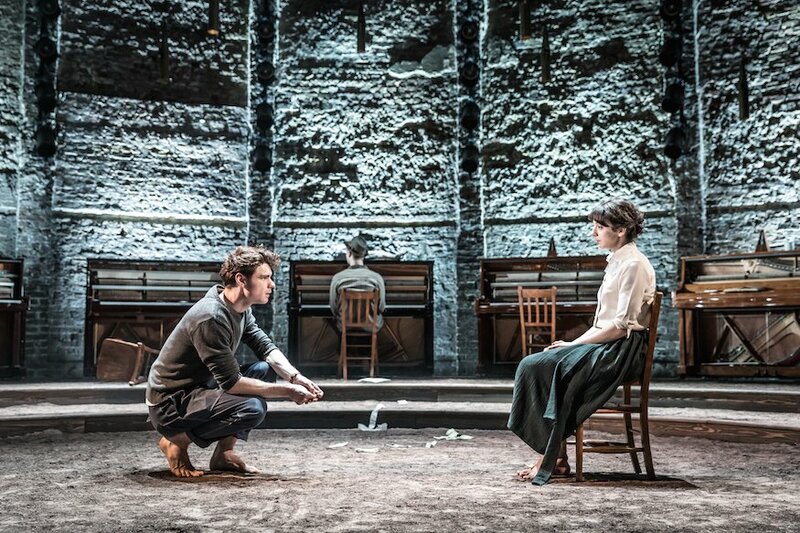 Matthew Needham and Patsy Ferran in Summer and Smoke at the Almeida. The young actress Patsy Ferran played Alma, and offered the kind of detailed, particular, and sensitive performance that we had been missing the night before at Julius Caesar. Rebecca Frecknall, a young director working at the Almeida for the first time, stripped away many of the realistic surroundings of the play. Many among the group felt that as a result they had actually experienced the play more fully. So many lines will stay in our minds for a long time after this production. On Saturday, winter finally found London! Undeterred, tour-goers used their free day to walk along the Thames, to see additional plays (including Harold Pinter’s The Birthday Party with Zoe Wanamaker and Toby Jones) and opera, and to visit the Tate Modern, with its expansive Mondrian show. Many of us gathered for drinks back at the Royal Lancaster Hotel at the end of the evening, to toast an amazing week of theatre and conversations, and to spend a little more time with friends new and old, and to say our farewells–for now.